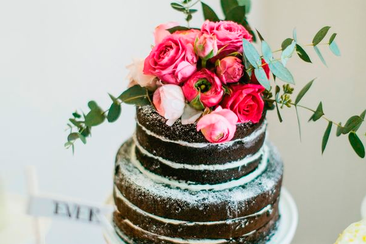 Weddings can be expensive, but that doesn’t mean you have to skip on the cake! There are cakes suitable for every budget, style and taste . 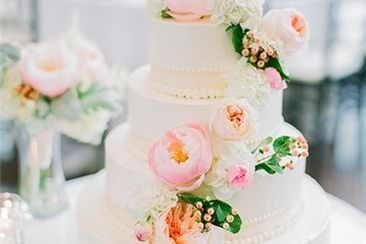 These are 20 of the most amazing wedding cakes out there, combining beauty and affordability. 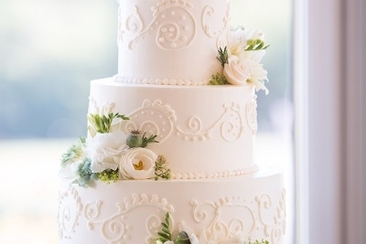 You’ll never go wrong with adding floral embellishments to a cake. Here, the use of white against a neutral beige background has an effect that is both stunning and classy (and easy to accomplish!). Ribbon piping along each tier and a decorative ribbon with the couple’s name around the bottom finish the entire presentation. For more casual affairs, injecting a little whimsy with sugared flowers and creative piping can be a great way to jazz up a simple cake. With three tiers, this cake has a modern feel due to the discs used to layer the piece, but the flowers keep it light and casual. 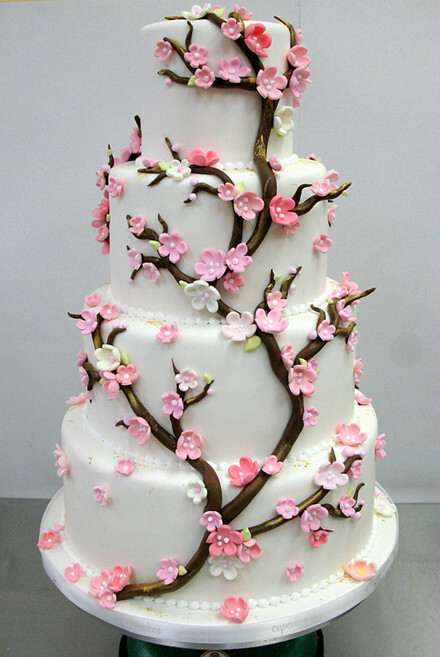 Cherry blossoms are perennial favorites for decorating amazing wedding cakes, and you can make use of both the tree and falling petals by decorating a four-tier cake with candy flowers. A white backdrop provides striking contrast to the blossoms’ colors, and you can use pearls or simple icing dots to jazz up the transition between layers. 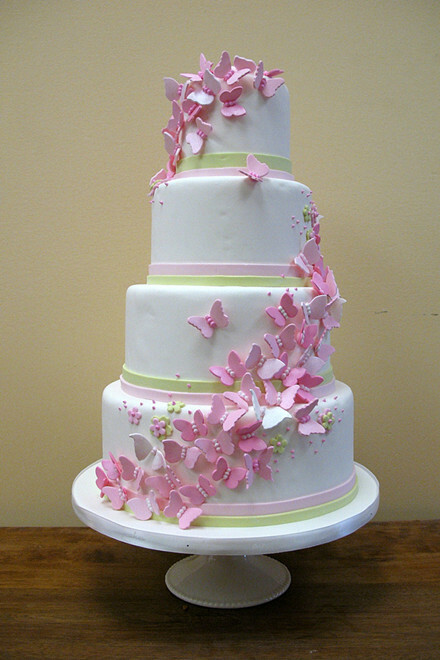 A cake decorated with butterflies is perfect for spring weddings, but can also be great for any time of the year. A four tiered white cake with various pink-hued butterflies is both simple and elegant. Using pastels like yellow and mint green for accent colors and adding small flowers make the design extra special. 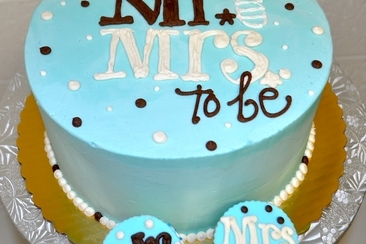 A bold and graphic cake is an attention-getter, and can be customized with your wedding’s colors. 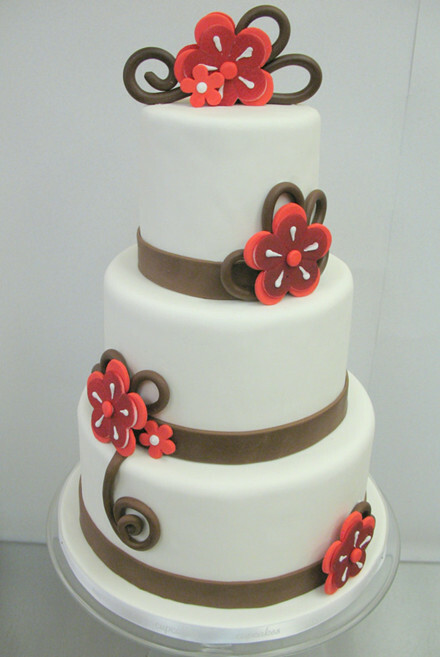 Brown strips piping at the bottom of each layer of this three-tier cake make the red flowers really pop. Even though it is simple in design and style, it is still eye-catching. Amazing wedding cakes don’t have to be complicated – sometimes less is more. This cake allows the contrast between pink and white on each of the three layers to provide an elegant effect, and it is topped with flowers and berries, perfect for the season. A black and white minimalist effect can pack quite a punch. These are great for formal weddings, as they create an air of luxury. Using four or more tiers with a simple embellishment can be both easy and full of class. You can really pull a wedding together using a cake decorated with the floral arrangements in your wedding. Not only does this make sure everything is coordinated, but it means a simple white cake with some frosting embellishments can immediately turn into a grand centerpiece, using what you already have on hand! Pink and brown work excellent together, and they can take a simple cake to special in no time. 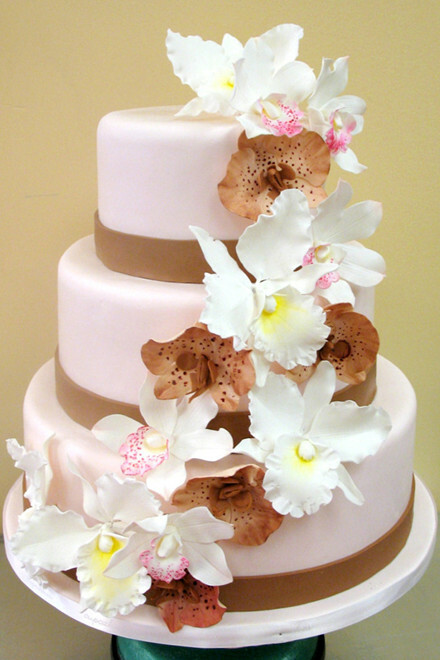 On this cake, cascading orchid flowers are a particularly elegant touch, and add vibrancy and movement to the simple tiers. Either candied flowers or real ones can be used, depending on your taste and budget. 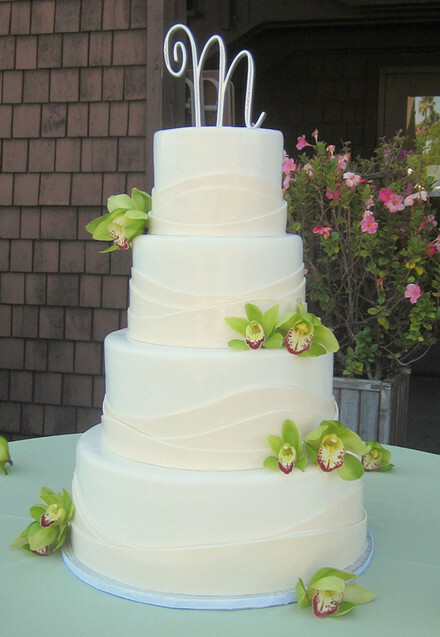 A simple blue orchid cake is wonderful for daytime weddings, since it is both elegant and intimate. 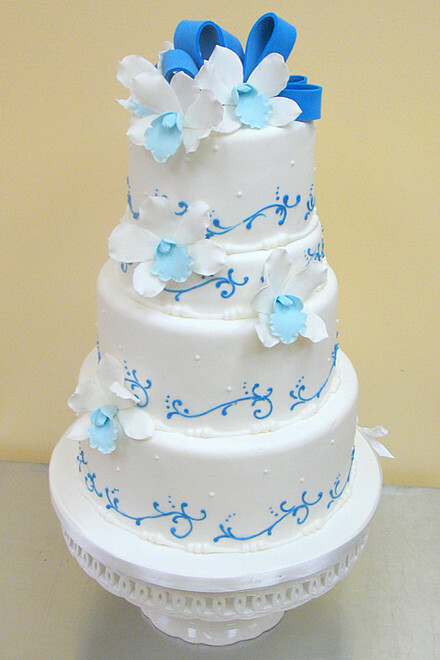 This four-tier white cake is lightly decorated with blue icing, but the flowers transform it into something special. Using fondant layers for a bow on the top finishes it all off. 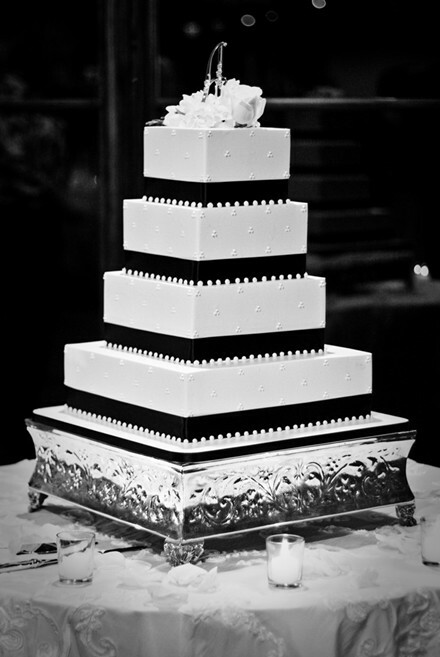 For a more contemporary take on the classic wedding cake, channel some Chanel with pearls and a lot of black and white. This cake – while 4 tiers – keeps things unique by having each layer be a different height, creating a neat visual effect. Adding simple cascading flowers as a final embellishment lightens up the stark minimalism while keeping things classy. This cake is perfect for fall weddings. 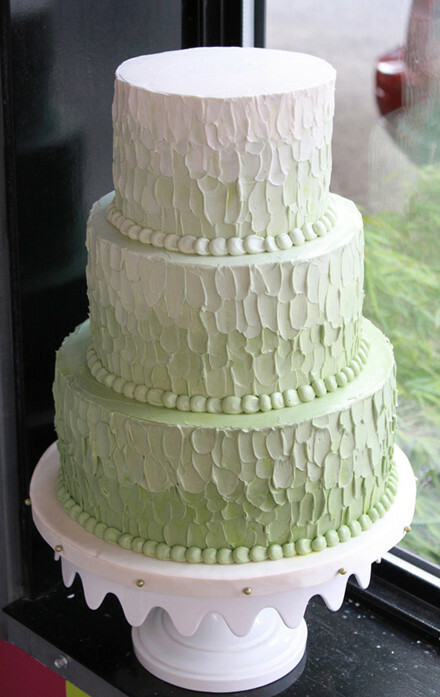 Using leaves – real ones if possible – can make for amazing wedding cakes that are perfect for photos! 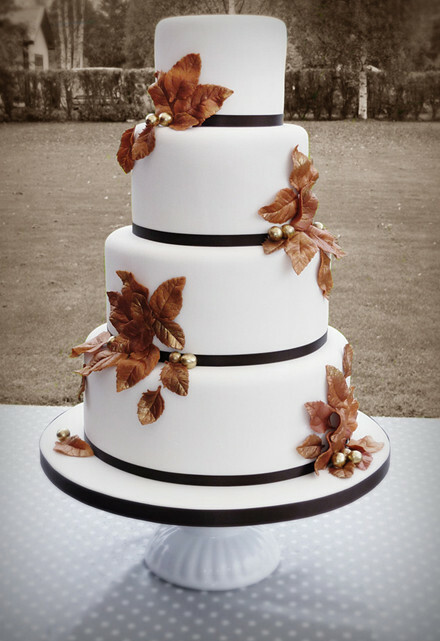 Using a neutral white cake with black highlights allows for the colors of fall leaves to really pop. Consider finding embellishments in reds, oranges, and gold to really capture the full effect of the season. 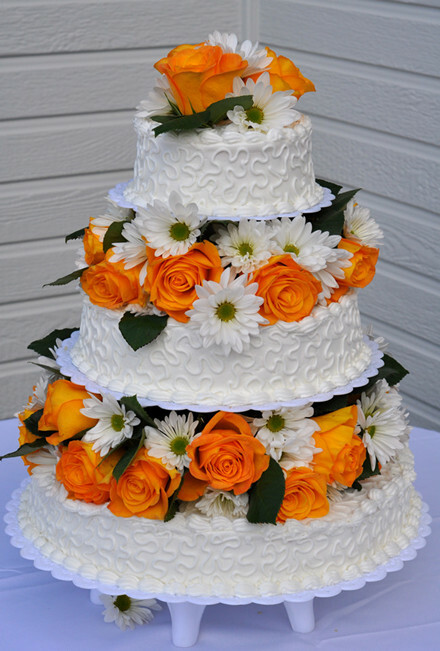 Any wedding can make use of a simple tiered cake with some daisies on top. Using three tiers, each separated by a ring of balls, this cake both stands out and doesn’t steal your spotlight. 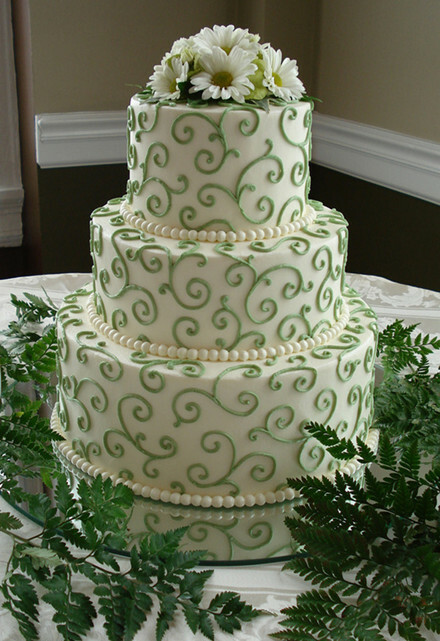 Green piping is an easy decoration that makes this cake look custom. 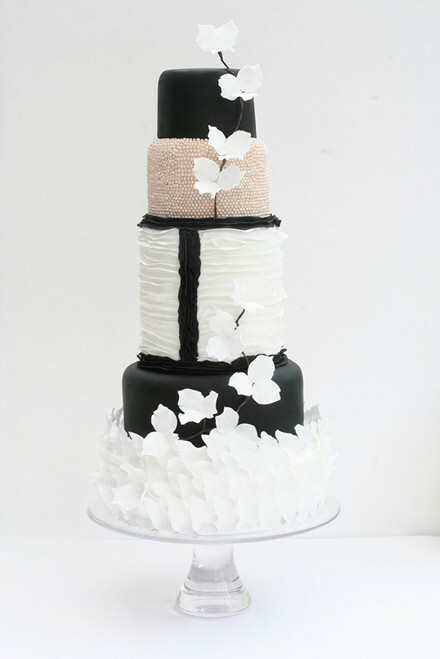 Plain and elegant, an ivory wrapped cake is perfect for all occasions. In this case, all you need is two slightly different variations of white to wrap a four-tiered cake with. The great part is you have an elegant base to work off of, and you can add decorations like fresh flowers to finish it off. For the artistically inclined, a textured ombre cake is a great choice. With three tiers and a texture that is reminiscent of paint applied with a palette knife, this cake is both beautiful and simple. Each color is slowly blended into the next, which means you can also customize it with your colors. 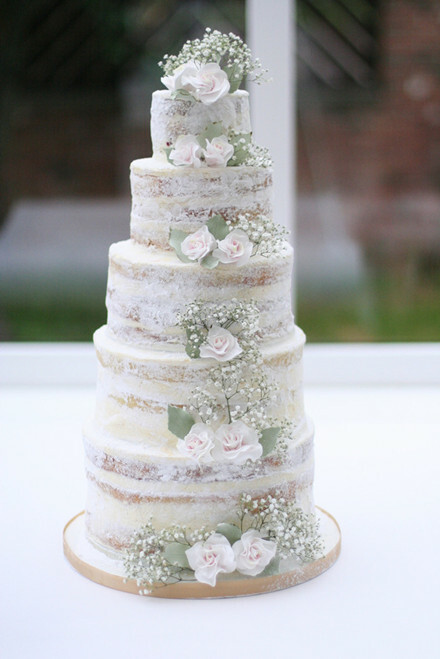 Some of the most amazing wedding cakes are those that are the simplest! Naked wedding cakes skip the heavy frosting and fondant for a rustic take on the traditional. A classic five-tiered cake can be lightly dusted with sugar or given a light layer of frosting, but it is the additions of flowers or other decorations that give the cake its ultimate look. 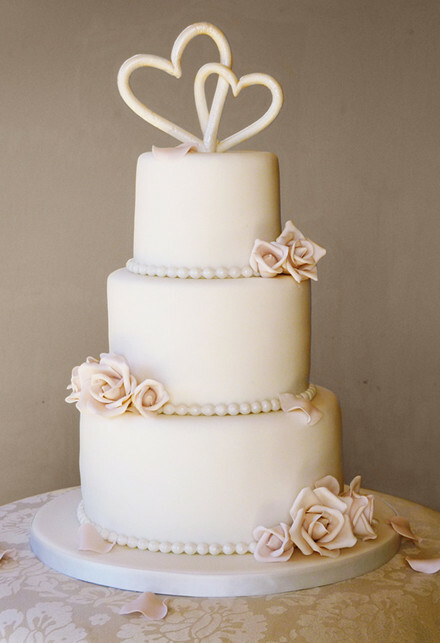 Simple and serene, this pale rose cake is topped with two hearts, a unique take on the traditional cake topper. The simplicity of colors in this cake is also what makes it elegant, and it can stand out in an environment that is heavily decorated. With simple beading along each layer and a few strategically placed roses, this cake is perfect for all styles. 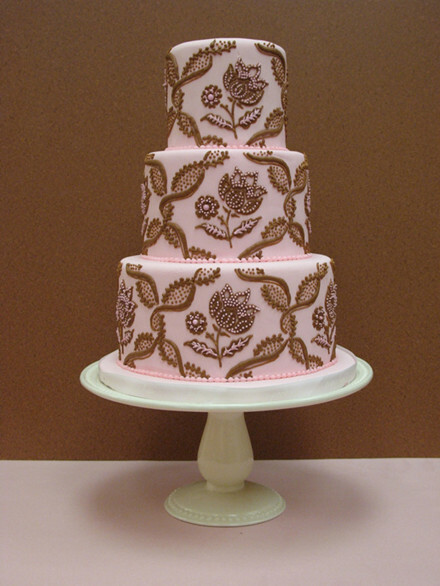 A chintz cake can make a simple cake look spectacular. Here, the play of pink and brown used to make intricate patterns makes the cake look as stunning from afar as it does up close. 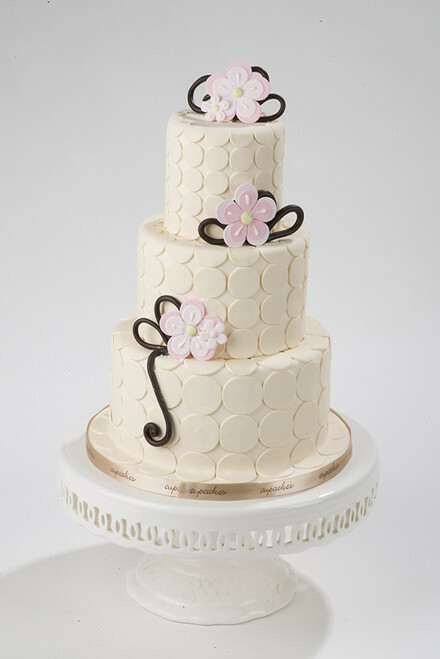 No need to add flowers or toppers to a patterned cake so as not to overwhelm the design. 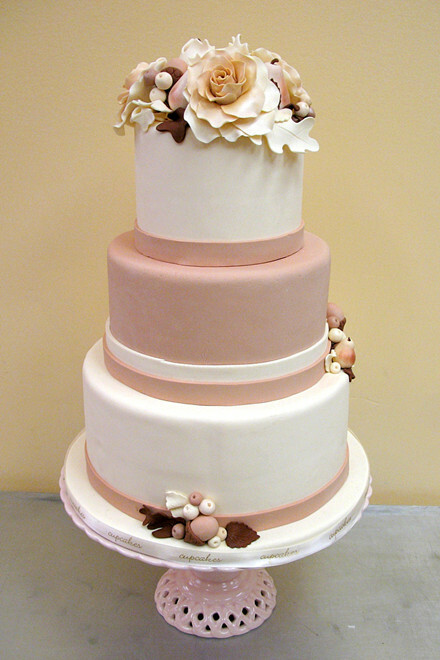 Spring pastels are an excellent choice for wedding cakes, and they can add a pop of color to any affair. 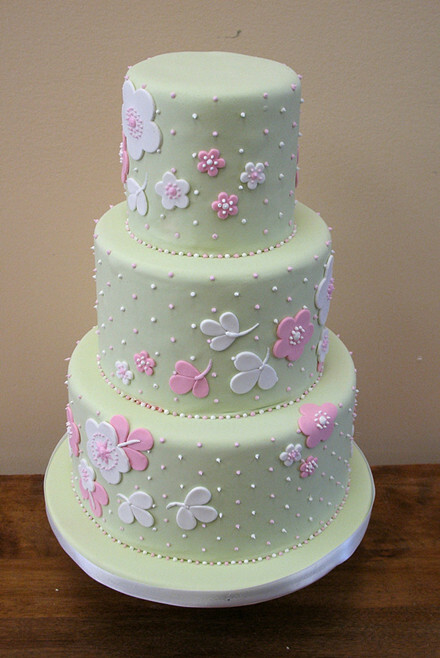 A three tiered cake can be decorated with pinks, greens, and other light colors for a stunning effect. In this case, small piping dots do a lot of the décor work, while candy flowers add an extra layer of special. Give your night the celebration it deserves with a gold swags cake. 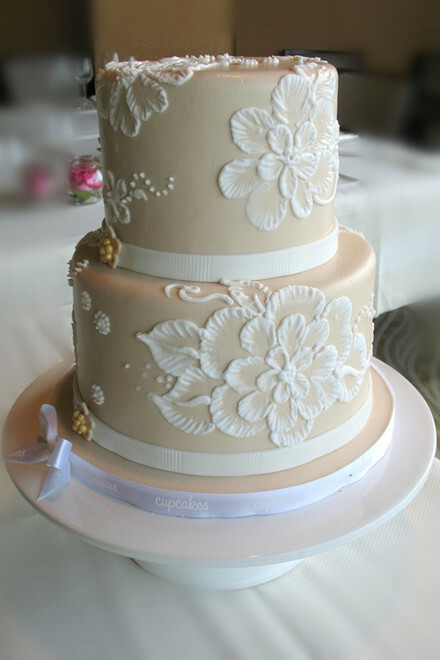 While it looks expensive, this effect can be created with layering fondant or even using real fabric if needed. 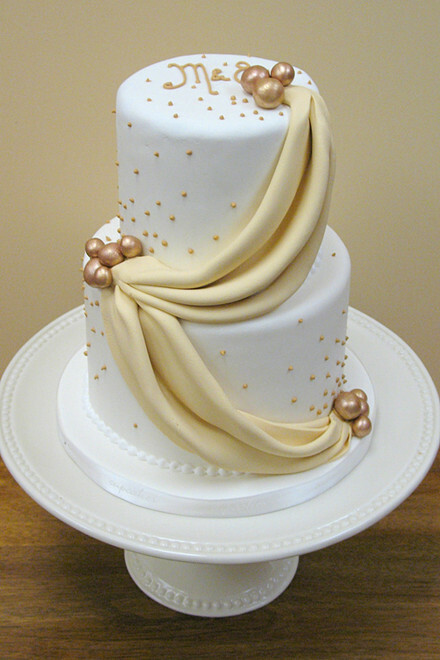 Gold dots of frosting and some gold beads can really top things off. Keep things classy by inscribing initials on the top of the cake. Stress no more over finding the best wedding cake flavors. Exotic cake flavors and combinations are the latest trend and this article will guide you through some exciting ones! Cupcake wedding cakes are becoming more and more popular. In thousands of cupcake choices, we compile 20 cutest wedding cupcakes with many great details for inspiration. 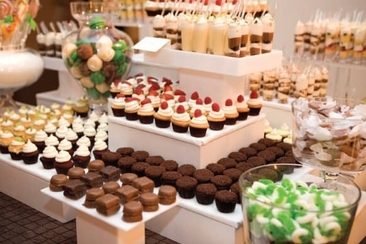 Are you looking for a nontraditional take on wedding desserts that are tasty and fun? 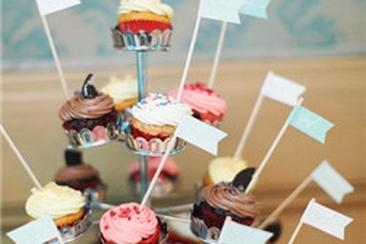 Check out these 25 alternatives to wedding cake to suit different preferences. Check our list of Top 20 wedding anniversary cakes! You will love these cute yet gorgeous ideas!Classic or modern, romantic or cool, we have everything you need. Server responsed at: 04/20/2019 5:09 p.m.